Designer Naoya Matsumoto and her peers at Seian University of Art and Design have created a unique meeting space for students on the Japanese campus. Their creation, a pop-up bar, is created from six panels of locally-sourced reeds called Yoshi. The chaotic construction resembles a traditional gabled roof structure in abstract form. 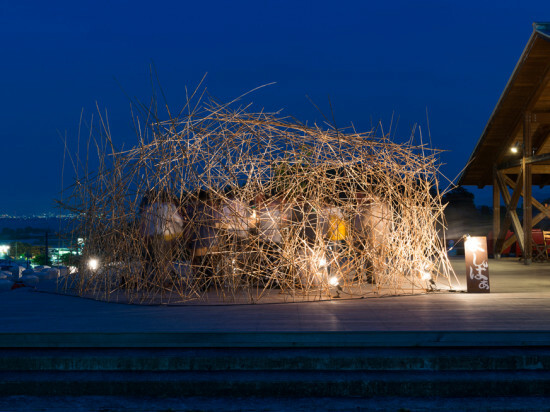 Each year, students of the design school are challenged to create objects from the Yoshi reeds which grow freely around Lake Biwa, an area close to the university campus. The dried reeds which form the outer skin of the structure are connected at intersecting points, and explode outwards in a controlled, yet chaotic fashion. These intersecting reeds provide glimpses of the intimate bar space within, and at night, the use of flood lights creates an enchanting, glowing effect inside the pavilion. With a production time of two days, the unique structure provides students a relaxing, breezy escape, and is also highly portable and recyclable. What’s the coolest place in Los Angeles? It may be right over your head. Starting in 2014, thanks to an update of the Municipal Building Code, all new or refurbished buildings will be equipped with “cool roofs.” A cool roof is built of reflective rather than absorptive material. Compared to traditional roofs, cool roofs can be as much as 50 degrees cooler on the roof surface, and can lower interior building temperatures by several degrees. Los Angeles is the first major American city to pass a cool-roof ordinance. The movement to cool Los Angeles’s roofs was sparked by a recent UCLA study, which indicated a local temperature rise of between 3.7 and 5.4 degrees by 2050. Over the same period, the number of “extreme heat” days (during which temperatures rise above 95 degrees Fahrenheit) is projected to triple in downtown Los Angeles, and quadruple in the San Fernando and San Gabriel valleys. “We sort of looked at, well, what can we do locally to offset some of that warming,” David Fink, Director of Campaigns at advocacy organization Climate Resolve, said. “The obvious thing was to...alter much of our paved surface, and that really comes down to roofs and streets.” Climate Resolve organized a one-day conference on cool roofs in March, at which time its members began working with the mayor’s office, the City Council, and the Department of Water and Power (LADWP). LADWP agreed to expand existing incentives to offset any cost increase associated with alternative roofing materials. The Los Angeles City Council passed the update of the Municipal Building Code on December 17. Climate Resolve is working towards outfitting existing low-income apartment buildings with cool roofs. While the project is currently on hold, Fink explained, it remains a priority for the organization. “They can really be good models for other multi-family housing projects,” he said. 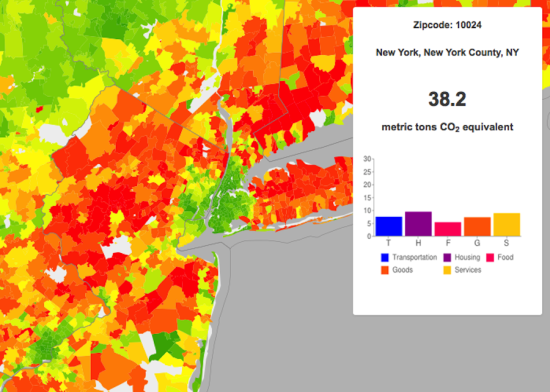 In addition, “the folks who live in these developments can use those benefits more than just about anybody else.” Cool roofs, after all, have the potential not just to reduce greenhouse gas emissions, but also to prevent heat-related deaths. In the meantime, Climate Resolve’s top goal for the new year is to turn the city’s attention to street level, and the benefits of non-absorptive paving. “There’s a huge opportunity there, and LA’s the perfect place for it, because of the climate, and how much paved surface there is,” Fink said. Compared to the cool-roof initiative, a “cool streets” ordinance may be harder to come by. “The city has traditionally been fairly intransigent in terms of using something new. They continue to do what they know, and what’s inexpensive—because they own these [asphalt] plants,” Fink said. Fink and his colleagues at Climate Resolve remain optimistic, however, especially since the Bureau of Street Services agreed to launch several pilot alternative-paving projects next spring. 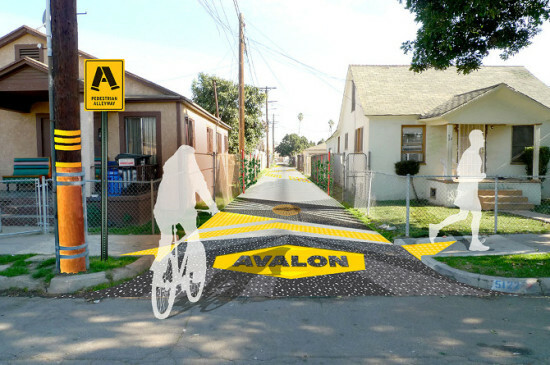 “We anticipate that LA, like [for] cool roofs, will be the first major city in the US to use cool paving,” Fink said. 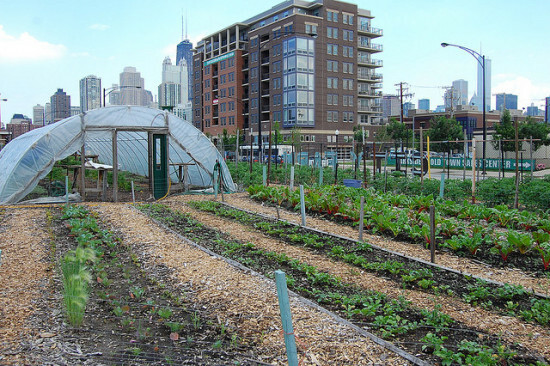 Chicago on Friday released a progress report on its Sustainable Chicago 2015 Action Agenda. So one year after the city set 24 goals for itself, how are we doing? Few goals are complete, but according to the city we've made some progress on all of them. Energy efficiency is one standout. Illinois recently placed in the American Council for an energy Efficient Economy's top 10 most energy-efficient states. Earlier this year the city passed an ordinance requiring large buildings to report their energy usage, focusing on the 1 percent of buildings that make up roughly 20 percent of the city’s energy use by buildings. (In 2011, AN looked at some of the ways Chicago architects and planners hoped to make their city a hub for smart-grid technology and clean energy.) Transportation was another standout, led by two key projects: Divvy bikesharing and the rails-to-trails project formerly known as the Bloomingdale Trail (The 606). But the city also touted progress on its goal to green Chicago’s airports, citing the launch of a consolidated rental car facility at Midway. A car rental facility, though a logistical boon cutting vehicle emissions from shuttle buses, might not seem the best icon of green transportation. But Chicago-based United Airlines made a big push this year to investigate biofuels suitable for its planes—a move that could bode well for an industry typically called out for high carbon pollution. 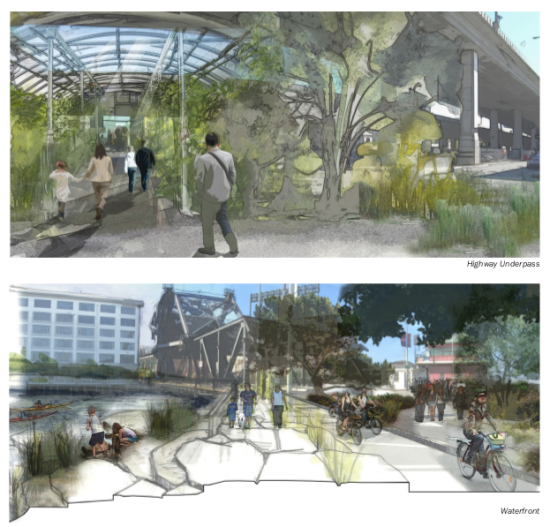 The city also gave itself plenty of credit for its plan to make the riverfront "Chicago's second shoreline." Read the full report here. Austin’s new temporary art installation, THIRST, is inspired by Texas’ ongoing periods of severe drought since 2011. According to studies conducted by Texas A&M Forest Services, over 300 million trees have succumbed to the state’s extremely dry conditions over the past three years. 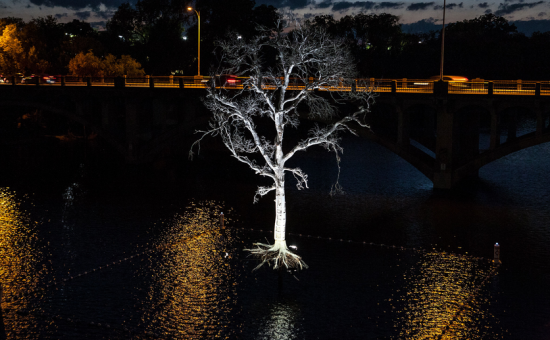 Located between the Pfluger Pedestrian Crossway and the Lamar Boulevard Bridge, a white-ghostly tree now hovers over Lady Bird Lake and is surrounded by a floating barrier. The public art installation symbolizes the lack of water that plagues Austin and other Texas territories. Its purpose is to trigger emotion and dialogue about the tragic number of trees that have died due to a serious lack of rainfall and increased human water usage in the region. The tree was staged by Women & Their Work, a visual and performing art organization founded in 1978 and best known for their pioneering artistic spirit and commitment to the enrichment of the Texan cultural experience. Through their work, they seek to engage the community at large in issues that pertain exclusively to the local culture and the built-environment. The tree is a 35-foot cedar elm which has been painted white and stands atop a pedestal over the water. Another major component of this art piece is the installation of 14,000 prayer flags on which black trees have been imprinted. THIRST on Lady Lake seeks to acknowledge the devastating impacts of drought in Austin and to address water conservation issues in Texas. Its striking appearance and levitating stance aims to trigger a discussion about the impacts of climate change and seeks to promote action for conservation, sustainability, and the general well-being of the eco-system. 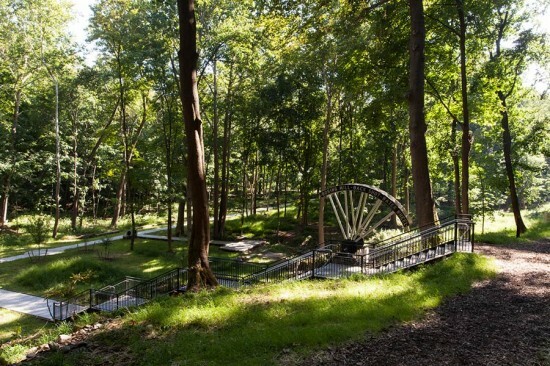 This project is also unique in the sense that it did not receive any city funding. Contributing artists include Beili Liu, Emily Little, Norma Yancey, and Cassie Bergstrom. THIRST will on view publicly until December 26, 2013. You might know Renzo Piano as the architect behind many of the world's leading museums, but get ready to meet Renzo Piano, wind-turbine expert. Testing has commenced on Renzo Piano’s small-scale wind-turbine blade at the Molinetto Test Field near Pisa, Italy. 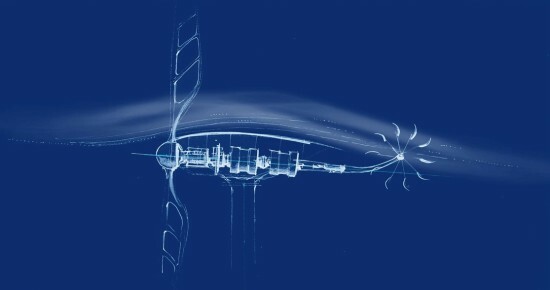 Piano’s turbine blade resembles a dragonfly’s wing and incorporates elements from the insect that promote stability in flight in order to allow the turbine to tolerate gale-force winds. Piano's slender, two-blade turbine differs from the customary three-blade scheme and has proven to operate successfully in low-intensity wind. To avoid spinning too quickly during storms, larger turbines typically use particular blades that stall at too-high speeds, or computerized systems that regulate the blade angles according to wind speed. Such systems are too costly to use with small-scale turbines, as they do not generate enough power to justify the price. The dragonfly turbine, which benefits from tough, lightweight composite resources, takes advantage of even the slightest breeze—it utilizes winds of only 6.5-feet-per-second for rather endless power. It can also be used effectively even at lower elevations than its larger counterparts. Designed with transparent plexiglass panels that emphasize the internal carbon structure, the turbine has minimal visual impact. While not in motion, the blades align with the mast to blend in with the environment. Held to the ground by cables, the tower is just 65 feet tall and 13 inches in diameter. The dragonfly has generated over 1200 KWh of energy over the course of a couple months. The prototype will continue to be tested for a few more months, followed by mass production as part of a groundbreaking approach that aims for advanced performance on all renewable technologies. Eben Bayer and Gavin McIntyre, co-founders of Ecovative, want the world of material packaging to enter “The Mushroom Age” and they have the approval of the Buckminster Fuller Institute. 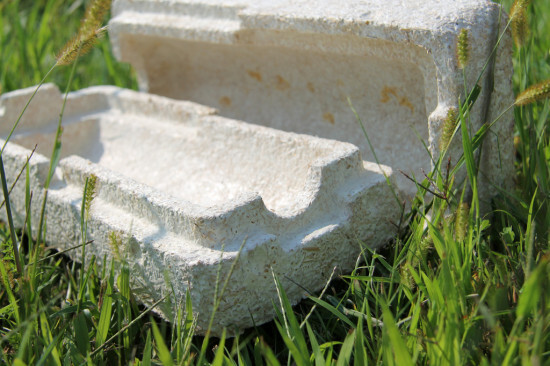 Founded in 2009, the upstate New York company has developed biocompatible, strong, lightweight, and fireproof fungi-based packaging as a sustainable replacement for polystyrene foam, widely used but made of environmentally harmful plastics. In August, AN reported Ecovative’s Mushroom Packaging project as a semi-finalist in the 2013 Buckminster Fuller Institute Challenge. This week, BFI awarded the entry first place in its $100,000 competition for socially responsive design. Combining agricultural waste and fungi tissue into a “mushroom material,” Bayer and McIntyre discovered that they could grow the solution into the shape of any mold, dry it, and create a strong solid with characteristics similar to Styrofoam. But, unlike Styrofoam whose production releases toxic substances, packaging made of mushrooms is net-positive and creates a closed loop production system. It is also cost-competitive. Bayer says that Evocative hopes its natural and ecologically friendly mushroom packaging will “completely displace petroleum-based packaging in the market.” He continues, “We’ve taken the best of agricultural mushroom technology, living systems technology, and paired it with serious, logical, engineer-type thinking about how we use these living systems. And then come up with a really innovative product.” After discovering the unique bonding ability of mushroom mycelium, fungi tissue with branch-like growing fibers, Ecovative has already begun expanding its use beyond packaging and into material for inexpensive housing, furniture, surfboards, and footwear. In a statement announcing Ecovative as their 2013 Challenge winner, BFI praised the initiative as a “ground-breaking enterprise” and “an extraordinary example” of “comprehensive, anticipatory, ecologically responsible, feasible, replicable, and verifiable” design for the improvement of a pressing human problem. New York City Council passed legislation Wednesday that aims to save the city one billion gallons of drinking water a year. Four bills slated to be implemented by summer 2012 will curb bottled water usage, reduce leaks, refine water efficiency standards, and ban some water-inefficient equipment. The water efficiency legislation affects new construction and changes to existing buildings and includes reducing the allowed flow rate of plumbing fixtures like faucets, showerheads, and toilets and requiring alarms and sub-meters to detect leaks in some water equipment including roof tanks. In a city that uses one billion gallons of water each day, or about 125 gallons per New Yorker, savings from these efficiency improvements add up fast. “The bills we are passing today use a multi-prong approach to increase water efficiency standards in the City," stated Council Member Erik Martin Dilan, Chair of the Committee on Housing and Buildings, in a release. 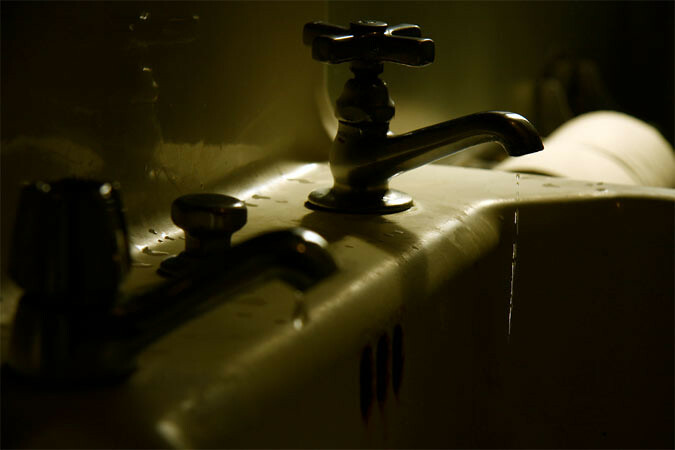 "They encourage the use of products that conserve water, require the installation of sub-meters and alarms to catch water leaks, and seek to increase the use of drinking fountains. These bills not only have the potential to protect the environment, they also have the potential of saving New Yorkers a substantial amount of money." These new regulations were drafted by the Green Codes Task Force, part of Mayor Michael Bloomberg's Urban Green Council which has been exploring ways to green the city's construction codes. Bragdon’s leadership of the regional government will be remembered for the addition of substantial green spaces to the region, bringing fiscal sanity to Metro’s budget, somewhat frosty relations with the suburbs, and an ongoing wrestling match over the issue of whether to expand the urban growth boundary. He's also a big advocate for alternative transportation, and The Oregonian says he may even be a contender for mayor in 2012. Of Portland, that is, not New York. (Unless of course things go especially well...) As for our mayor, he said the following in a release outlining his decision: "David is an exceptional addition to our team here as we continue to implement the initiatives in PlaNYC and work to update the plan and expand it to include solid waste." Wonder if that was in the job description?